Carex’s Day-Light Classic is a good option if you are looking for something large and powerful. The height and tilt of this lamp are extremely customizable with a unique setup. It isn’t very aesthetically pleasing, but it makes up for that with its effectiveness. The lamp uses fluorescent bulbs, which means replacing them can get pricey. The lamp itself has been varying in price for the last few months. Anything below $100 is not a bad price for a lamp of this size and with this degree of customization. There is a little bit of setup and work that goes into making sure the lamp works properly when you first receive it, but after that, it shouldn’t be difficult to maintain. 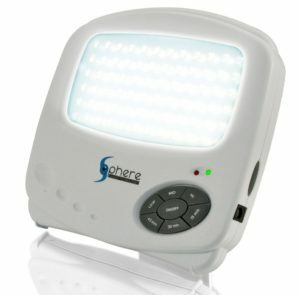 This glare-free, UV-free, 10,000 lux lamp is a great treatment device for seasonal affective disorder. The Day-Light Classic is made by Carex Health Brands, a subsidiary of Compass Health Brands. They have worked for 35 years to provide in-home medical products that preserve dignity and promote self-care. They specialize in all manner of personal medical devices, including mobility aids, pain management devices, and bright light therapy. 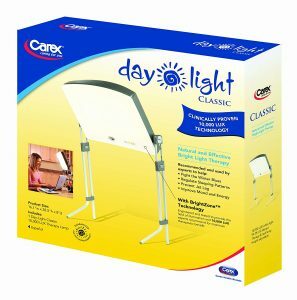 We have also reviewed the Carex Day-Light Sky model from the same manufacturer. 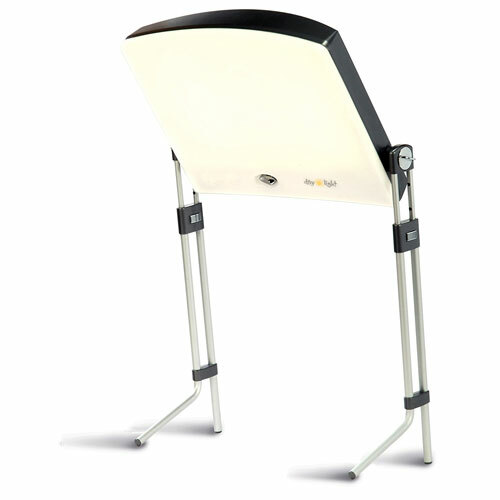 The Day-Light Classic consists of a large light-box on two telescoping, parallel legs. It’s large and quite bulky comparatively. 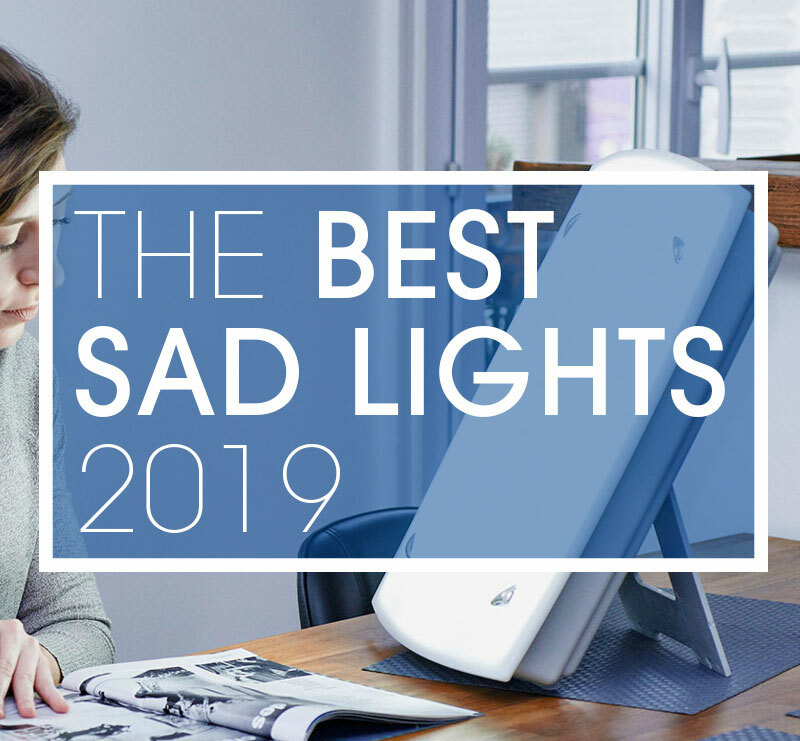 As the company says, it doesn’t look like a therapy light – but it doesn’t exactly look like it belongs in my home, either. It looks like a crafting light or a shop light and seems obtrusive. 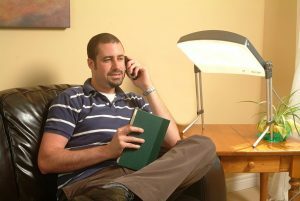 The lamp is definitely bright, but the design is bulky and the therapy sessions take a little getting used to. 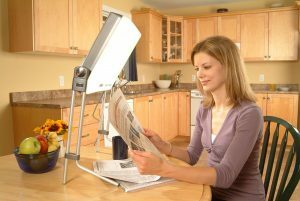 The legs give you room under the lamp to read or do any other activity, but sitting so close to the lamp is a bit awkward. The design elements are decent, even if it is aesthetically unappealing. It appears to be well-made of sturdy materials. The power cord is six feet long and is a standard three-prong wall plug. The setup process for this device is more complicated than other devices. The manufacturer instructs you to plug the light case in to check if the bulbs are working before operating the device. There are three bulbs in the lightbox and they stress that they might not all be functional and include instructions for removing and re-installing the bulbs. When this step is complete, you will need to attach the legs to the lightbox and adjust the angle and height to your perfect position. Once all parts are attached and verified to be functional, you need to turn the light on and adjust the brightness switch on the right of the unit. This lamp is perhaps the most complicated lamp I’ve used. The manual provides a wealth of information about how to change the bulbs, the warranty (which is an excellent 5 year, limited warranty), and other product information. 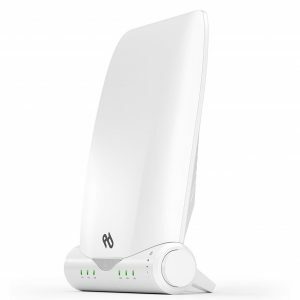 The Day-Light Classic puts out 10,000 lux at about 12 inches on the highest brightness setting. The lower brightness setting is only intended as a task light. It works well for detail-oriented work, though it is a bit challenging to get the light in a comfortable position for use as a task light only. At 24 inches, the device puts out about 2,500 lux, which means you will have to increase treatment times. However, the manufacturer makes a point to state that you should not use the lamp for more than an hour at a time. The task light setting is very bright. This setting only uses one of the bulbs but still puts out enough light to make reading by it slightly uncomfortable. For close-up, detail-oriented crafting work the task lamp function might be perfect. The lamp uses three fluorescent tubes. Replacement tubes can be purchased from the Carex website for $15 each. These bulbs are placed behind a diffuser panel which softens the light and provides 99.3% UV blocking. There is a lot of customizability to the angle and height of this lamp, which is certainly a perk. Carex usually makes good stands for their lamps and this is no exception. The stand scores top marks in our test which is no surprise once you see how adjustable this is. The legs telescope out to between 10 and 17 inches tall, putting the total height of the unit on its tallest setting at about 24 inches. There is also a tilt feature for the lightbox itself, so it is extremely easy to get the perfect setup position. There are two different brightness settings. Though there are three bulbs in the fixture, the highest brightness (meant for light therapy) uses just two of the bulbs. The lower brightness setting only uses one bulb and is only recommended for use as task lighting. The Day-Light Classic is only useable at 110 volts and will need an adaptor for other power sources or types. The lamp is not very portable, however, despit the manufacturers claim that you can travle with it in a carry on bag. The light face is rather large (13 x 16 inches) and the entire unit weighs almost 7 pounds. The lightbox itself, while well-made, seems too fragile to travel with. The unit does not mount to a wall, but there is a built-in stand at the back of the lightbox should you wish to remove the legs and use just the box. 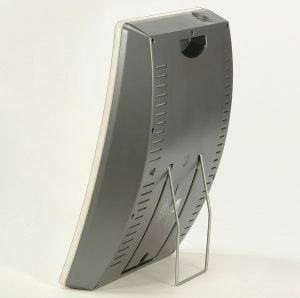 The stand is a kickstand-type affair that you can rest the lamp against for a stable alternative. Do you like this article? If you have liked what you have read, please consider purchasing a light through one of our affiliate links. You will get the best prices on the internet of which we get a small commission. This takes no extra effort on your part and helps us to keep the website running and helps fund our reviews and provide quality content for our readers. I am the founder and chief editor of Heliotherapy Reviews. 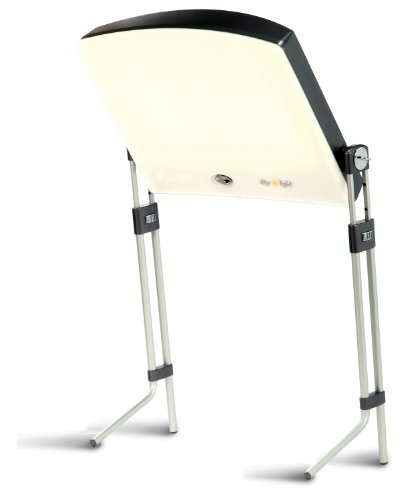 Diagnosed with Psoriasis 20 years ago, I was introduced to Narrowband UVB light therapy which I used to successfully clear my psoriasis. 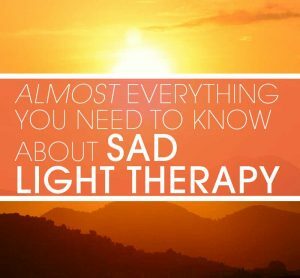 This started a passion to learn more about the benefits of light therapy.